Passover popovers fall into the category of “old school” Jewish food. Like mandel bread or matzah brei, they’re one of those dishes my grandmother always made during the holiday. These recipes were popular in a time when every baked Passover dish seemed to be made of matzah meal, and before there was an abundance of grain-free flours and quinoa. You’ll find recipes for these popovers in classic Jewish cookbooks, and I think they deserve some renewed attention. The batter for these popovers is similar to choux pastry. Choux is a pastry dough that consists of flour, butter, water, and eggs, and it’s the base for eclairs, gougères, and cream puffs. When choux pastry gets baked, it puffs up and crisps on the outside, but is hollow on the inside. Instead of flour and butter, the batter for Passover popovers is made with oil and matzah meal, making them dairy- and chametz-free. There’s a little sugar added for flavor, but these skew savory rather than sweet. Pastry dough might sound intimidating to make, but the ingredients are few, and the only tools required to make the batter is a large pot and a wooden spoon. The eggs give the popovers their rise, an airy texture, and richness. I’ve added turmeric for a golden hue. 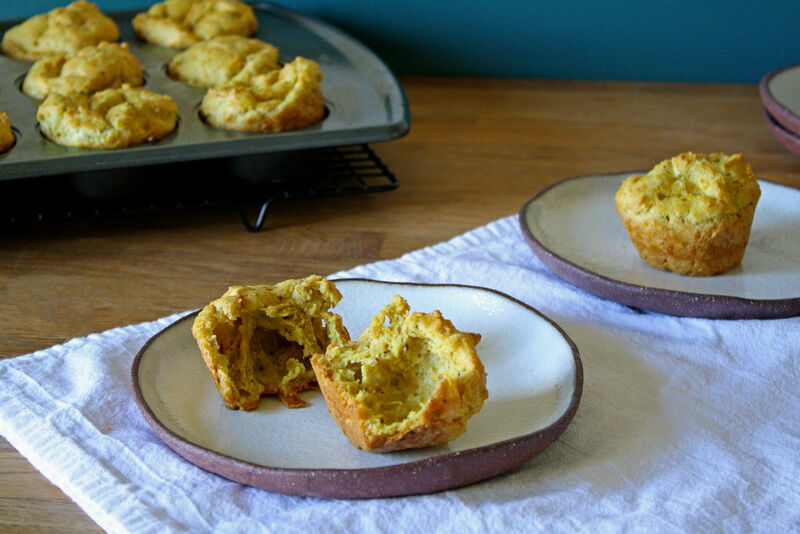 There’s no need for a special popover dish — a muffin tray will work just fine. You can use either a standard 12-cup tray or make them in a mini-muffin tin if you prefer. I love to serve these as a Passover dinner roll alongside my entrée at the seder. During the week, the popovers go well with any kind of soup, or even at your breakfast spread with some jam, served with tea or coffee. Add oil, water, sugar, and salt to a large pot and bring the liquids to a boil. Simmer for a minute until the sugar and salt dissolve. 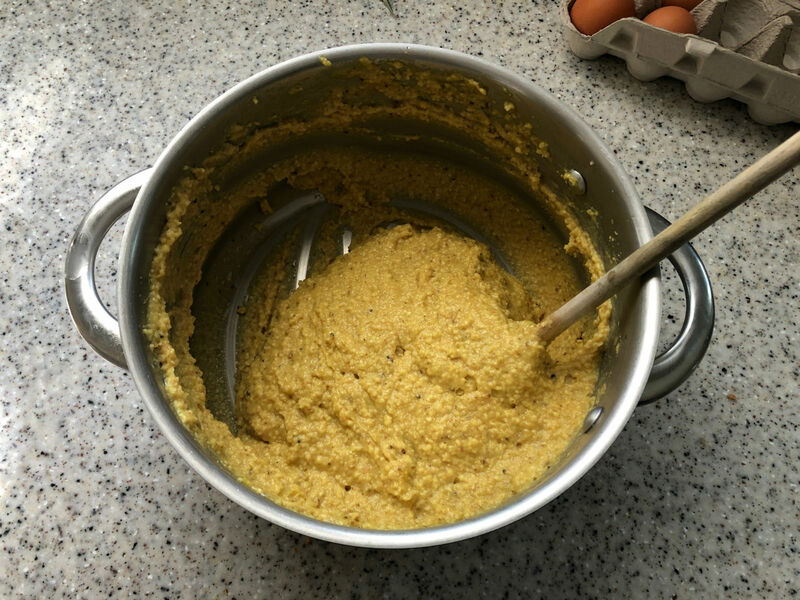 Remove the pot from the heat and use a wooden spoon to quickly mix in the matzah meal and turmeric. Allow the matzah meal mixture to cool until it is warm to the touch. If the mixture is too hot it can scramble your eggs! Fill each muffin tin ¾ full. 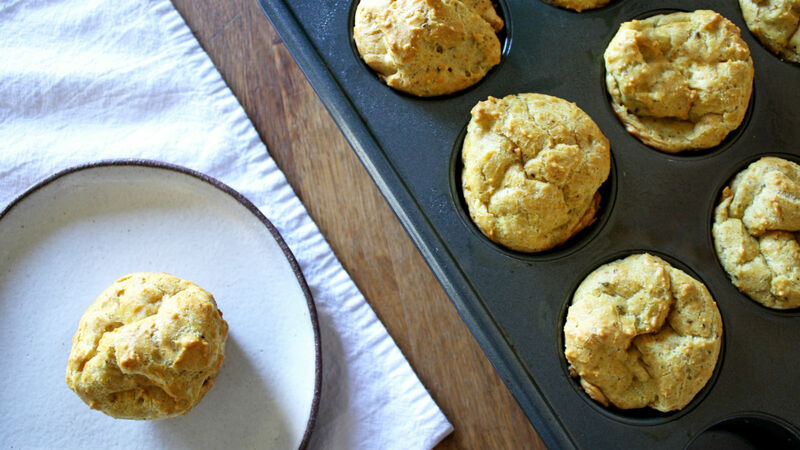 You will have enough for about 16-18 popovers, more if you use a smaller-sized muffin tin. Cook the popovers in batches, one tray at a time. Bake for 10 minutes, then reduce the oven temperature to 325°F.